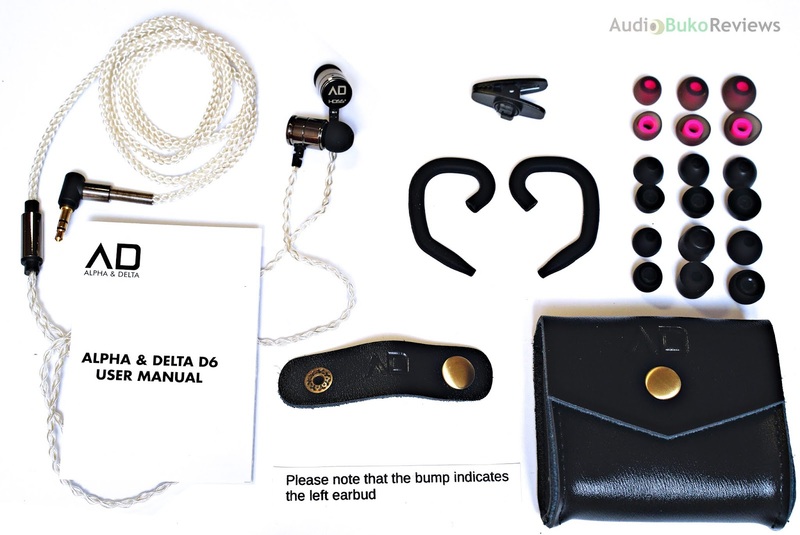 Introduction: Alpha & Delta is an audio company that started producing their first IEM (The AD01) back in May, 2015, steadily building up their products till their most recent release with the D6 in November, 2017. "Based in Singapore, Alpha & Delta is a work of love by a group of audiophiles with experience in the earphones retail industry. Being avid audiophiles ourselves, we understand what audiophiles want and we strive to produce quality products at an affordable price." 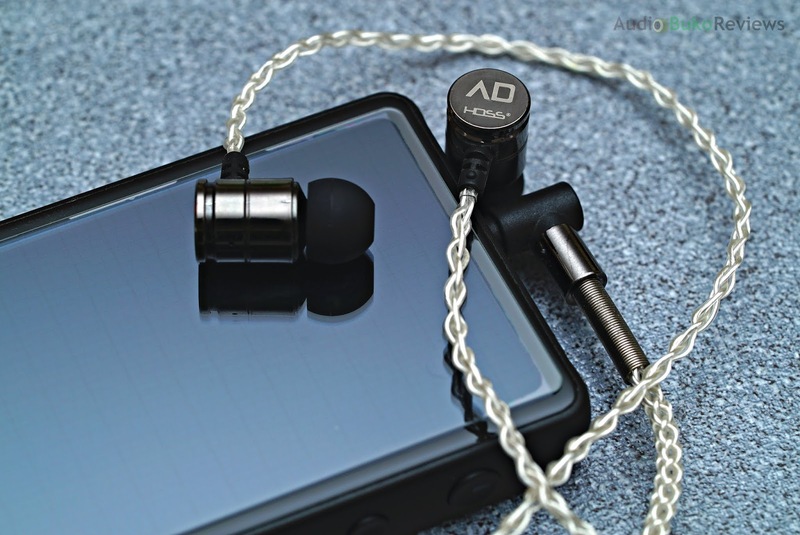 - a direct quote from their website and it shows their dedication to that vision with the D6, having 2 goals of excellent sound and durability for it. I would like to thank Alpha & Delta for providing me with a review sample in exchange for my honest and unbiased review. 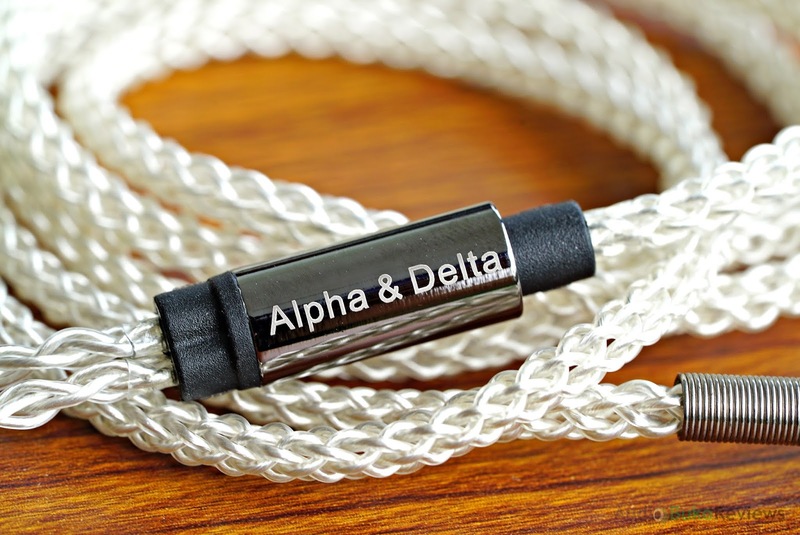 You can buy the Alpha & Delta D6 at Lend Me UR ears or locally if your retailer has them in stock. The 16Ω and 105db sensitivity of the D6 does translate into real world good volume and ease of driveability for even the most modest of sources. Aside from the standard specs, there are two technologies of note with the D6 that makes it a very interesting IEM, "The dual chamber acoustic design redirects reflected sound waves into a uniquely designed second chamber which absorbs these sound waves. 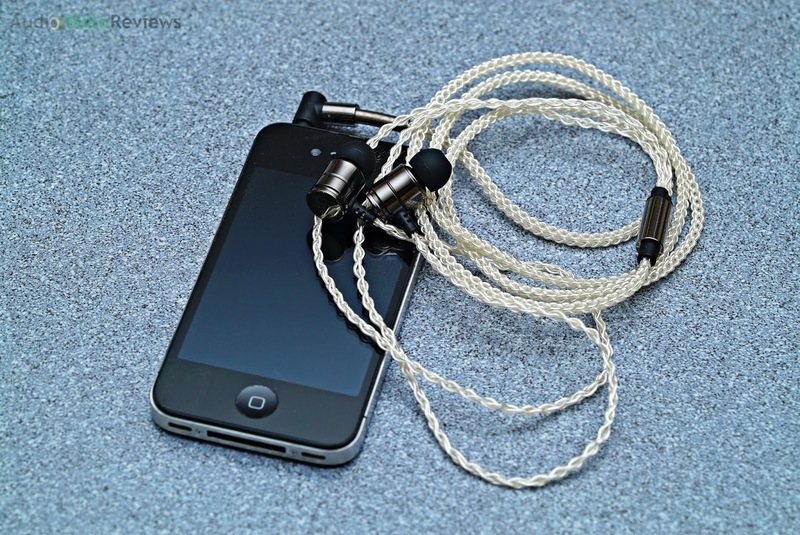 This reduces distortion and improves the clarity and soundstage of the earphones" and HDSS or High Definition Sound Standard tech (more details can be found at the HDSS site) and that "Both technologies serves to reduce distortion in earphones, improving clarity and soundstage." Things that are note worthy and what I'll look for in the sound section more deeply. 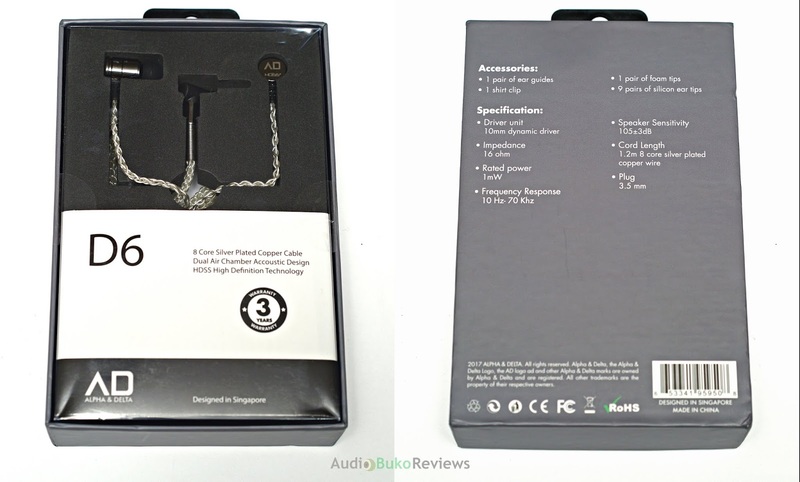 Unboxing: The Alpha & Delta D6 comes in a simple box with a clear plastic cover displaying the IEMs and branding. It's may not be the most efficient in terms of space saving, the contents will actually surprise you after you open it. 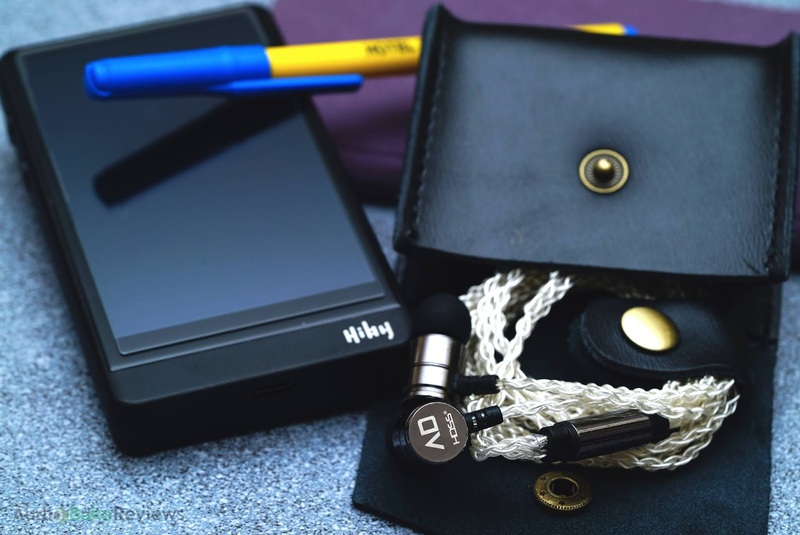 The D6's accessories are pretty generous, there are 9 pairs of silicone tips with various bores and shapes, 1 pair of foam tips, 1 pair of ear wire guide, a shirt wire clip, a leather cable organizer and a beautiful leather pouch. The manual and the IEMs make up the rest of the contents. 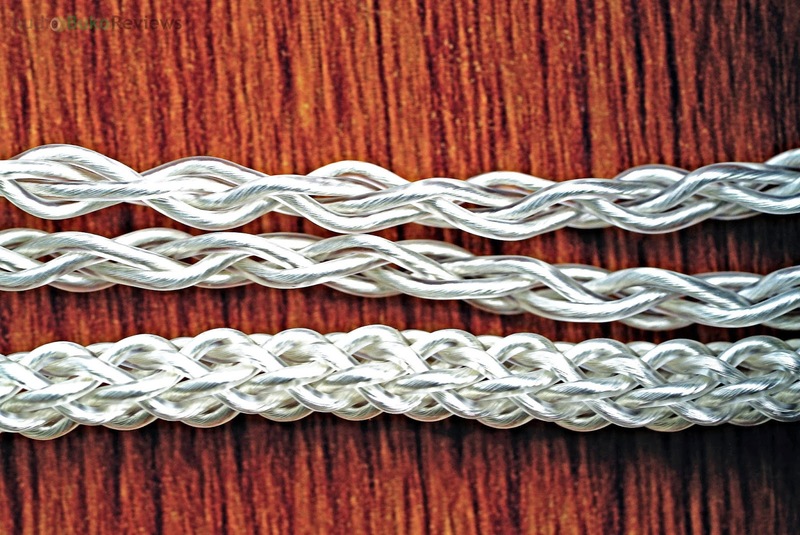 Cable: The D6 cable is an eight core silver plated copper (SPC) cable that "allows greater signal transmission, ensuring great clarity." This cable is beautiful to behold, functional, flexible, has softness and has (for me) the perfect mix of smoothness and tactile grip along with a reinforced Y-split with the company branding on the metal housing, it looks high class. The D6 plug is made of hard plastic, reinforced by a metal sheath and protected by a metal spring at the wire exit of the plug, this helps it absorb impacts and acts a strain relief to help the cable withstand abuse. Build/Design: In the D6 thumps the diaphragm of a 10mm dynamic that's designed to work with the dual chamber and HDSS system and tuned by Alpha & Delta themselves. Designed like a 'bullet' and machined smooth with no sharp or angular edges, this IEM design translates to a quick insert and removal, and a simple universal fit design. The size and shape of the D6 will very likely protrude from shallower ears and definitely is not the best to wear when you want to sleep while listening to music. And though the provided tips give a good seal music wise, they do not block out external noises well. Like without music playing through it, I could hear the soft hum of the air conditioner as well as most keyboards clicks. There are 2 outlet holes on the D6, one near the bottom stem of the nozzle and one on top of the shell (has a metal mesh screen), the one near the nozzle helps avoid driver flex and the one on top is part of the dual chamber design and HDSS. 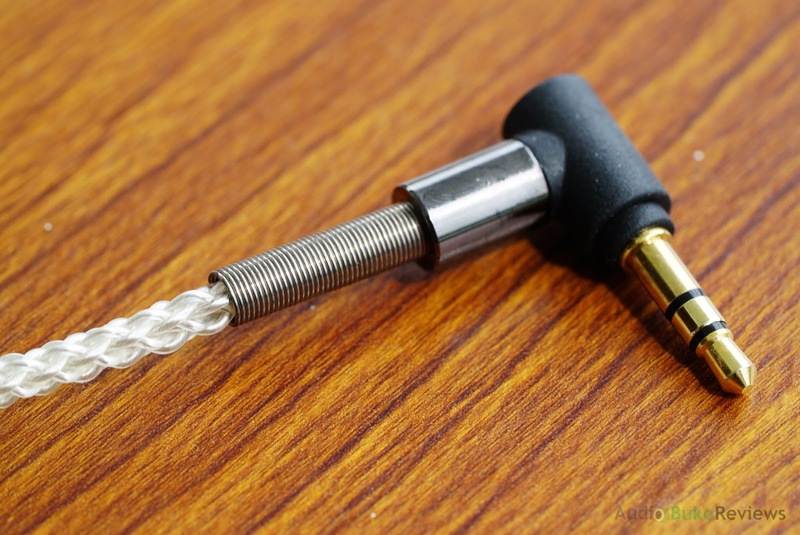 There is a very small L and R at the strain relief in the same direction as the nozzle which incidentally is covered by a very fine mesh that will likely protect the insides from small dust particles as well as the occasional ear wax pieces. As a whole, the D6 feels solid and gives you the comfortable feeling of durability. 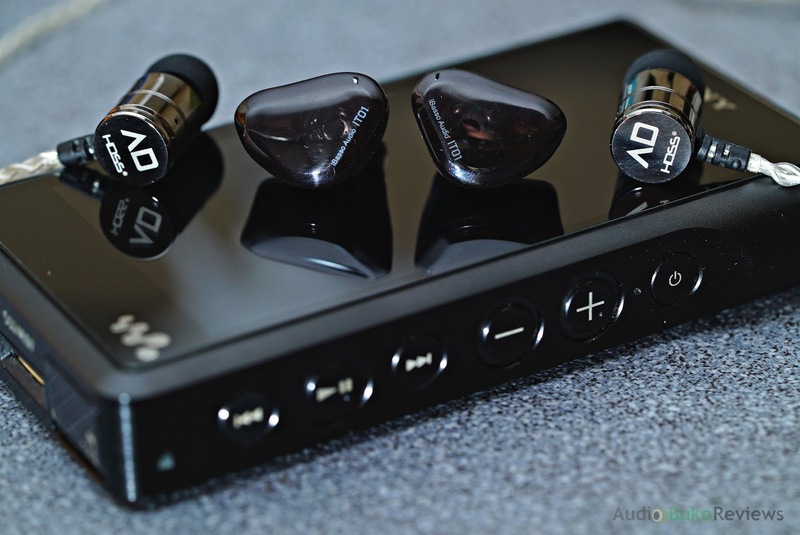 Sound Analysis: When I first listened to the Alpha & Delta D6, I knew it was good, there was all the things I wanted, good bass, great mids and highs, ample layering prowess and stage with a fun sound signature overall. But I also knew there was more to it than that, the tech involved was relatively new to my ears and my own sound signature bias played a role at first, but slowly, the picture of how the D6 sounds revealed itself the longer I listened to it. And now after 200+ hours of music, I'd like to present my findings. Bass: The D6 sounds near neutral in the bass department but that doesn't mean it's a bad thing. With minimal boosting of the bass, the sub-bass of the D6 sounds natural with it's rather deep extension but average quantity, this translates to the sub-bass reaching deep with a more upbeat rumble. Bass hits with a natural weighted impact, Get Lucky's bass beats will be felt in an unobtrusive but palpable way, I daresay, just the way it was meant to sound and feel without overwhelming the listener. The bass decay is a bit quick and controlled with enough warmth that gives the listener an overall clean yet smooth experience. Mids: Being a lover of mids and vocals, the D6 gives me a satisfying musical experience as the general middle frequency is slightly forward with very good levels of detail and natural timbre. Vocals sound clean and clear, from a Foggy Day to Photograph, male vocals sound crisp and distinct while female vocals share those traits blended with a more forward position, this allows songs like Do What You Have to Do, to shine with emotive prowess. Treble: The highs are well extended, defined and controlled, though you won't call the treble smooth, the D6 is neither harsh or sibilant. Listening to Who Will Save Your Soul's acoustic guitar strings floating into your ear with gentle abandon, above and apart from the vocals and other instruments will show how much natural airiness and crispness the D6 has to offer. Details here (applies to all frequencies to some degree really) shine due to the clarity, stage and layering provided by the D6's dual chamber design and HDSS. Soundstage: The D6, thanks to the two techs designed into it, have a great amount of depth and width in it's soundstage, with sounds and vocals coming more from outside your ear and depending on the track, can extend to a few inches outward in all directions. Positioning is pretty accurate and overall sounds natural, specially for live or acoustic recordings. The separation, layering and detail retrieval is quite good and helps the D6's overall sound to be clean, clear and delicate (ie. very fine in texture or structure; of intricate workmanship or quality - as per dictionary meaning). Bass: The IT01 has a harder bass impact and a slower more emphasized rumble than the D6 but both have nearly the same depth of extension with the D6 having clearer resolution of bass notes. Mids: The IT01 has a bit of a V shape to its signature and the mids are a little bit recessed because of it compared to the more forward mids of the D6 in both male and female vocals. The IT01 has a bit more thickness than the more natural tonality of the D6, this gives the perception that the D6 is clearer in comparison and the IT01 smoother. Treble: The IT01 and D6 have similar tonalities, though the IT01 comes a bit ahead having a little bit more sparkle and the D6 with a little bit more clarity and upward reach in the upper treble area. Control of harshness and sibilance is effective and similar with both the D6 and IT01, but the IT01 sounds a little tight with regards to cymbal crashes where the bloom of the reverberating crash is shorter and sounds a little less natural. Soundstage: The horizontal stage width of the IT01 is wider than the D6 by a small margin though they share the same height and depth. Detail air, retrieval, separation and layering are again similar overall with a little bit of an advantage towards the D6. Conclusion: The Alpha & Delta D6 is an excellent sounding balanced IEM with a bit of an emphasis on the mids and vocals, where it's near perfect blend of natural tone, layering and clarity. 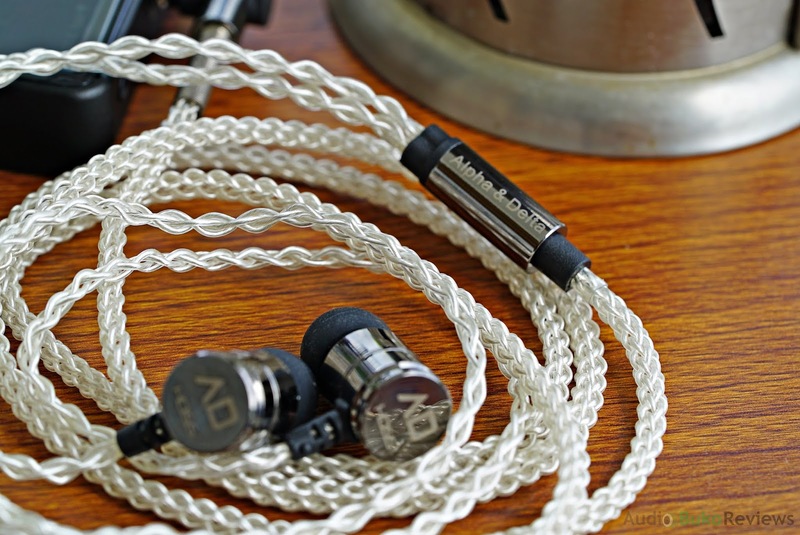 Coupled with goodly responsive bass, crisp airy treble, a no fuss beautiful 8-core cable, solid tank like build and amazingly generous accessories backed by a 3 year warranty, the musical D6 is a strong contender for you money in this price bracket. I'd recommend this for daily usage when you just want to leave your TOTL IEMs at home and still have something really good to listen to on your travels or if you like very good mids while having a near natural and balanced sounding IEM with good details, staging and durability. Pros: Near neutral and responsive bass, clear and detailed mids, spacious and natural highs, good staging and layering, solid build, excellent 8-core cable, amazing accessories, 3 year warranty.